The first known bassinet was used by the parents of the biblical character, Moses. It is a basket coated with pitch and tar which was used to make him float in the Nile river until he reached the Pharaoh’s palace. Then, from the 1600’s to the 1800’s, babies slept in hollow or carved out wood or logs. At the beginning of the 20th century, babies slept in beds made of iron which was the most sanitary at that time. However, such products expose babies to toxic materials like lead paint. Fast forward to 1973, the U.S. Consumer Product Safety Commission created the first safety standard for bassinets and cribs. After which, in 2010, new safety standards were put in place which manufacturers need to meet before they can sell their products. For a long time, parents have been using bassinets as a place for babies to sleep in, from birth until they are about six months. Modern bassinets commonly have built-in music and night lights, and most of them can be rocked to help soothe babies and for them to sleep better. One drawback of a bassinet is that they can’t be used for a long time because once the baby outgrows it, especially in America, they usually transition to a crib. So, if you have a newborn baby girl or you are looking for an awesome baby shower gift, the Disney Baby Ultimate Sweet Beginnings Bassinet might be the one you are searching for. This product is going to be discussed in detail below. You need to buy four AA batteries. It has four wheels for easy mobility. The manufacturer provides customer service. It has wheels that make it highly mobile. It has add-ons that help baby sleep longer. The mattress is firm enough to help prevent SIDS. It is compact so that it does not take too much space. It has a sturdy built. It has storage for baby’s things. The print is not unisex. The canopy does not cover the entire bassinet. It can’t be used when baby gets bigger. The mattress may be thin for some consumers. 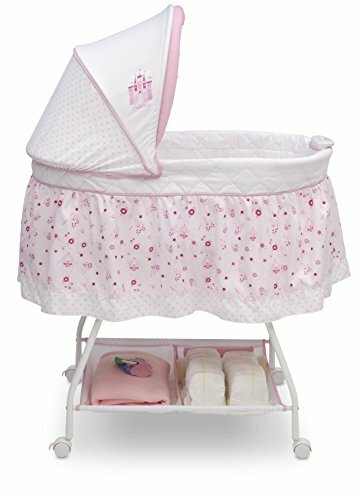 The Disney Baby Ultimate Sweet Beginnings Bassinet can be used by your baby girl from day one until she is about 15 pounds. It has built-in music, vibration, and a nightlight, which requires four AA batteries, to help your baby sleep longer and peacefully. A built-in canopy has also been incorporated to help block bright light that may disturb your baby. In addition, this bassinet has removable and adjustable parts. Reaching for your baby’s things will also not be troublesome because it comes with a built-in storage basket. Additionally, it also has wheels, so you can easily move it from one place to another. Wheel locks have also been incorporated to avoid accidental moving. What is more interesting is that it also comes with a mattress and a fitted sheet to keep your baby comfortable while sleeping. Furthermore, it has a gliding base, so you can rock your baby to sleep. Lastly, to ensure your baby’s safety, the manufacturer made sure that they followed the standards set forth by JPMA, ASTM, and CPSC. Similar to the Disney Baby Ultimate Sweet Beginnings Bassinet, the Delta Children Rocking Bassinet also comes with a mattress and a fitted sheet. 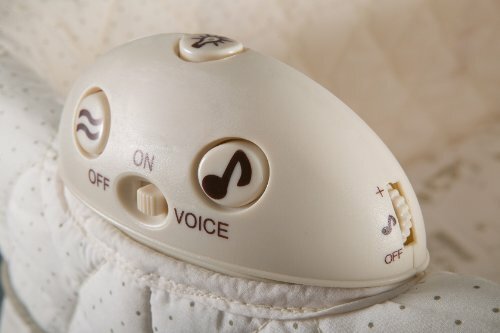 It also has a built-in night light, vibration, music, rocking mechanism, and an adjustable canopy for better sleeping. The manufacturer also provides customer service and followed JPMA guidelines. Moreover, it has storage space underneath for baby’s things and has a weight limit capacity of 15 pounds. Although this bassinet does not have wheels, it has a unique design feature in the legs so that moving it to a different location will be hassle-free. As for their differences, the design print of the Delta Children Rocking Bassinet is neutral, unlike the Disney Baby Bassinet which has a girly print. Even though this bassinet is JPMA certified, the Disney Baby Ultimate Sweet Beginnings Bassinet has additional certifications which are from ASTM and CPSC. With all these said, we can say that the better product is the Disney Baby bassinet because it has passed additional safety standards for baby products. The Disney Baby Ultimate Sweet Beginnings Bassinet is a good choice whether you are going to purchase it as a gift or for your baby. Its best feature is it has passed safety and production standards of JPMA, ASM, and CPSC. For a longer and better baby’s sleep, it has soothing music that you can play, as well as a vibration system and nightlight. You also need not worry about the baby while you are in the living or dining room since it has lock-equipped wheels that will help you roll it to a place where you want it to be. The storage space at the bottom of the bassinet is also a major plus since you can store a few of your baby’s things like diapers and clothes. Unfortunately, it does not have a variety of prints, but if you are not very particular about girly or boyish designs, this bassinet should work for either gender. Another downside is it does not grow with the baby, so you can only use it until he or she is about five or six months. Likewise, it is not foldable, making it unsuited for travels. In spite of its drawbacks, the Disney Baby Ultimate Sweet Beginnings Bassinetis still the ultimate product because it will help address the sleeping issues of your baby. This product will definitely help your baby sleep better and longer.